About 50% of people who try a yoga class for the first time don’t come back – why is that? Many reasons could be an explanation, but it is also time to acknowledge that most yoga spaces are not welcoming to people who suffer from and live with trauma. While not everyone in a standard class is traumatized, it is our job as teachers to take into account the possibility that some of our students actually are. This workshop is designed for teachers and teachers in training who wish to become more aware of the dynamics of trauma and who wish to make their classes more inclusive for everyone, or students considering taking a teacher training. We will review the mechanisms of trauma and tools to develop agency and empowerment in a yoga class. This workshop is NOT designed to allow teachers to work with specific traumatized populations, or to process and heal from trauma. Some elements of the discussions might be triggering. Open to yoga teachers and yoga teachers in training. Eligible for Yoga Alliance Continued Education Credit. While there will be a bit of asana practice, this workshop will consist mostly of discussions and lectures. 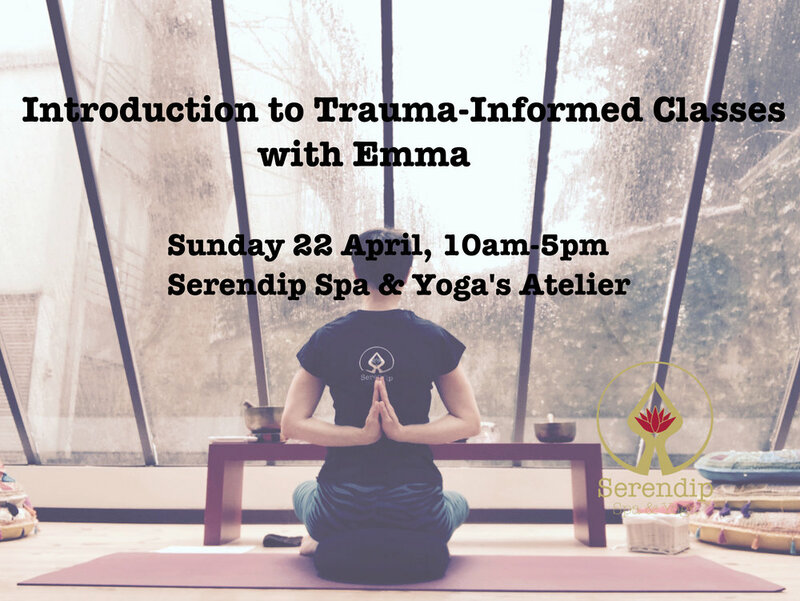 Your teacher: Emma is Serendip Spa & Yoga’s Head Teacher and Lead Teacher Trainer. She is a certified Vinyasa Yoga teacher, registered with Yoga Alliance as E-RYT 200 and YACEP (Yoga Alliance Continued Education Provider), a certified Trauma-Center, Trauma-Sensitive Yoga Facilitator (TCTSY-F), and certified Teen Yoga teacher. She has worked with people suffering from complex PTSD and cancer survivors, and will soon start projects with women victims of abuse, and disadvanted youth. Price : EUR 100 – Early bird of EUR 90 if booked and paid by April 10.